VATICAN CITY (CNS) — As the U.S. president’s personal envoy to the Vatican, the U.S. ambassador to the Holy See has a unique role in building a bridge between the political center of the United States and the religious-spiritual center of the universal Catholic Church in Rome. Like every U.S. ambassador, the diplomats it assigns to the Holy See function as a two-way street: They are messengers, representing the U.S. president in all matters and explaining the administration’s policies, and they are observers, acting as the eyes and ears of the United States and keeping track of what is unfolding at the Vatican. 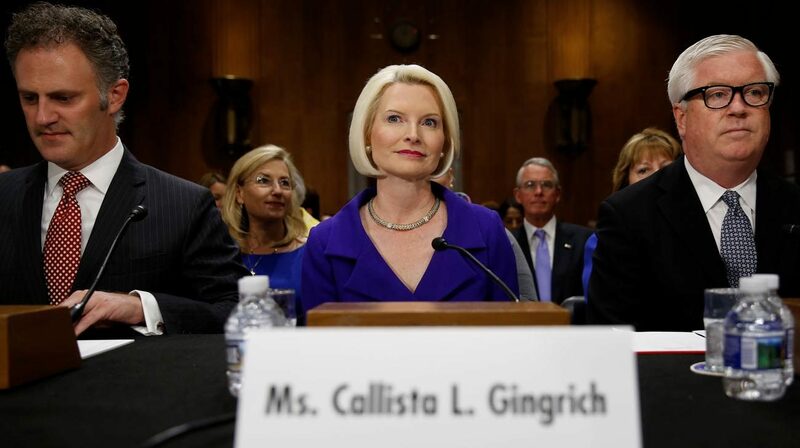 President Donald Trump has nominated Callista Gingrich to be his ambassador. The 51-year-old testified before the Senate Committee on Foreign Relations July 18 and was awaiting confirmation as the month drew to a close. The Holy See is more than just an independent sovereign state: It’s also the home of the pope and a font of moral-ethical responses to world affairs coming from the Roman Curia. For that reason, ambassadors here have a unique mission before them. “What I used to say is that I dealt in moral diplomacy, which is the diplomacy about the human condition and human dignity,” Jim Nicholson, former U.S. Ambassador to the Holy See, told Catholic News Service in Washington, D.C. Diplomatic work with the Vatican “didn’t deal in arms, in military basing, it dealt in what I called the soft power of moral diplomacy, of trying to create a life for people with more dignity, and more opportunity,” Nicholson said. Heading this sort of “moral diplomacy” does not mean the envoy has to be Catholic or even religious. While U.S. presidents have chosen Catholics for the job, it’s not a requirement — either by the U.S. State Department or the Holy See. While it is helpful that envoys already understand a good deal about their diplomatic partner, Nicholson said it also just takes being smart, curious and dedicated to learning about the Vatican and the relevant interests, concerns and core values the two sides share. New ambassadors typically attend “a sort of ‘basic training’ for ambassadors” offered by the U.S. State Department. The three-week course covers a wide range of topics, including “what the laws and regulations are, what the ethical considerations are, and then a lot of practical instruction that’s based on experiences of prior ambassadors that come in and speak,” Nicholson said. Once in Rome, the ambassadorship is not a one-person operation. In fact, the United States has one of the biggest and most active embassies to the Holy See. As her posting neared its end, Glendon said in late 2008 that one of the best things about being ambassador had been the huge variety of people she met and events she was involved in. “You never know what the day will bring, and the job varies with what’s going on in the world,” she said. Ambassadors also do not have be seasoned diplomats or set on building a career in the foreign service. They can come from very diverse backgrounds with ties in some way to the president. Traditionally, 70 percent of U.S. ambassadorships have been held by career diplomats and 30 percent by political appointees, according to U.S. Department of State’s platform, ShareAmerica. Political appointees with little or no diplomatic experience often have valuable assets, like having direct access to the president or strong contacts with important government offices or leaders back home. A Vatican source had told CNS in Rome that there were no written rules about what qualities the Vatican liked to see in a prospective ambassador. In general, the Vatican hopes each envoy is interested in the issues that are important to the Holy See and is keen on meeting and talking with Vatican officials. When Nicholson finished up his 40-month service in 2005, he told CNS he had the distinct impression that the Vatican expects more of the United States than it does of most other countries when it comes to being a partner or advancing shared values. Nicholson and other ambassadors who spoke to CNS over the years at the end of their tenure noted the wide latitude they had in spearheading or lending support to initiatives of common concern, such as religious freedom, humanitarian assistance and fighting human trafficking. “If an ambassador is willing to put forth a lot of work and endeavor and is willing to take some risks to initiate change, the job gives you a great potential to do that,” because “it also brings a great deal of resources to problems and issues that you identify,” Nicholson told CNS July 25. Whenever U.S. policies have contrasted sharply with those of the pope and the Vatican — as was seen with the U.S. military responses to the 9/11 terrorist attacks and the Health and Human Service mandate in 2012 — ambassadors put talks with Vatican officials into high gear to better explain U.S. positions, and they focus onto strengthening cooperation in areas where the government and church do agree. Spending so much time so close to the See of Peter also can impact the personal faith of the ambassador.